Are your kids heading back to school? Do you drive past a bus stop or a school zone during school hours? Do you know Pennsylvania's School Bus Stopping Law or penalties for violating the school zone speed limit or crosswalk law? No matter where you live, whether you have children or not, chances are these laws affect you. 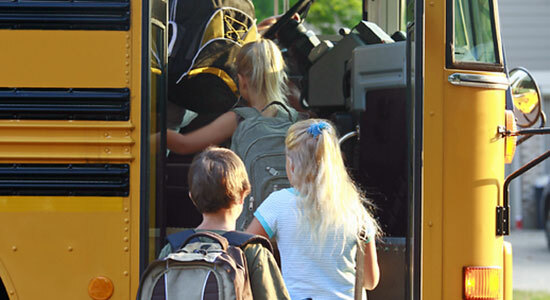 Approximately 1.5 million school kids are transported on Pennsylvania roads every day. In 2013, 4,735 people were killed in pedestrian accidents nationwide, and kids ages 10-14 had the highest number of injuries. Make sure you understand the School Bus Stopping Law, speed limits in school zones, and laws for drivers and pedestrians in crosswalks. You must stop for a school bus that has its red signal lights flashing and stop arm extended. You must stop for the school bus regardless of whether you're behind the bus, approaching an intersection where the school bus is currently stopped, or approaching the bus while traveling in the opposite direction. You don't need to stop for the school bus if there is a clearly defined section dividing the roadway (such as a median or concrete barrier). When in doubt, stop. You must stop at least 10 feet away from the school bus. You must wait until the lights have stopped flashing and the stop arm has been withdrawn before proceeding. Don't move until all children have boarded the bus or reached sidewalks after exiting. Watch for children at corners who may be entering another cross walk nearby. If you're convicted of violating Pennsylvania's School Bus Stopping Law, you will receive a 60-day suspension of your driver's license, 5 points on your record, and a $250 fine. The speed limit for school zones in Pennsylvania is 15 mph. If you're caught speeding in a school zone, you could face a fine of up to $500 and 3 points on your driving record. If you're caught speeding in a school zone a second time, you could lose your license for 60 days. Fines may increase for careless driving that results in serious injury or death. School zones aren't usually that long – be patient. If you know you'll be in a hurry, take a different route to avoid the zone. The school zone speed limit is meant to protect students' lives and prevent unnecessary injuries. Have you ever wondered what Pennsylvania's Crosswalk Law entails? Not sure of your responsibilities as a driver or pedestrian? Did you know that nearly 80 people died in Pennsylvania in 2010 when they were hit by a car while entering a crosswalk? Under the law, drivers must yield to pedestrians when they are in a crosswalk at an intersection. Drivers must also yield to pedestrians crossing at any other marked crosswalk (usually a bright yellow sign that says "State Law Yield to Pedestrians Within Crosswalk"). Drivers who violate the crosswalk law may face a $50 fine and 2 points on their driving record. On the other hand, pedestrians should only cross the street in marked crosswalks. Don't attempt to cross a roadway at any other point than within a marked crosswalk – also known as "J" walking. When not in a marked crosswalk, you must yield to vehicles on the roadway. Failing to follow the crosswalk law as a pedestrian may result in fines.